We’ve updated our ZA Domains WHMCS Registrar module and added a few exciting changes to this latest build. v2.6 of the ZA Domains WHMCS Registrar module includes an improved dashboard widget which falls in line with WHMCS’s styling changes introduced within WHMCS v7. The whmcs widget provides you with a quick overview of your Domain Reseller Account or Registrar Account and provides up the minute information regarding the number of domain names registered, expiring domain names, expired domain names and others. 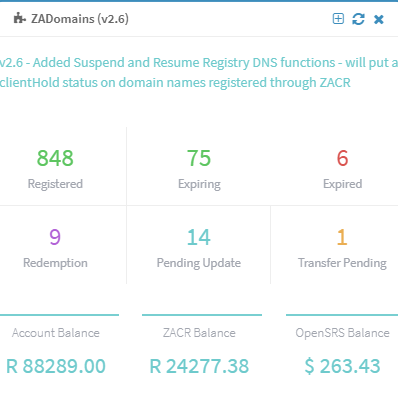 The WHMCS widget also provides an overview of your ZACR Registrar account balance, OpenSRS balance and ZA Domains balance. Additional features released within the ZA Domains WHMCS Registrar module include the ability to force or disable all API calls. Additionally, a new Domain Suspend function which provides registrars and domain resellers to change the status of a ZACR domain name to clienthold, and suspend the domain at a registry level. Download the latest version of the WHMCS Domain Registrar module from the WHMCS App store, or from within your ZA Domains Registrar or Domain Reseller account.